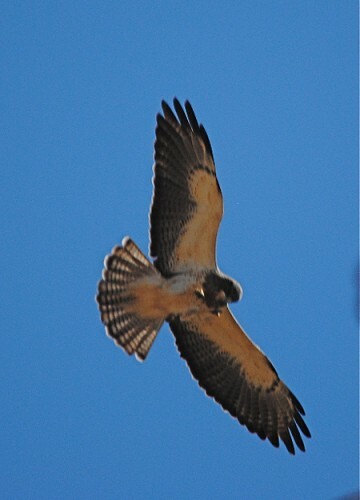 Return of the Swainson’s Hawks /Hawks Aloft Inc.
We get the greatest e-mails! I just love the excitement and enthusiasm among those of you who are dedicated raptorphiles, watching and recording them as you go about your daily lives. They’re BAAAAACK! We got this great message from Georgia Santa-Maria this past weekend. Up to 24 hawks were observed at one time soaring over Georgia’s property in Belen, NM. 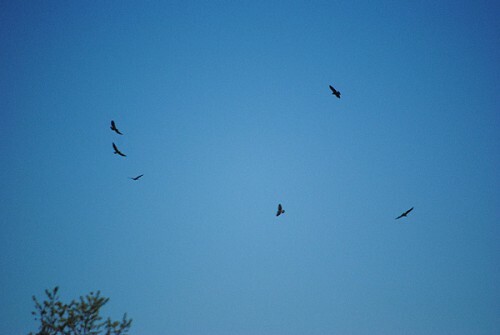 I took these pictures in my pasture, East of Belen, this morning– I’ve never seen a “flock” of hawks before, ever. There were up to 2 dozen birds at one point–too many to count. The most I could get in one frame was 9–but they were all over the sky overhead, and did not seem to be shy, or wary of us, (2 humans,) or my dogs, at all. 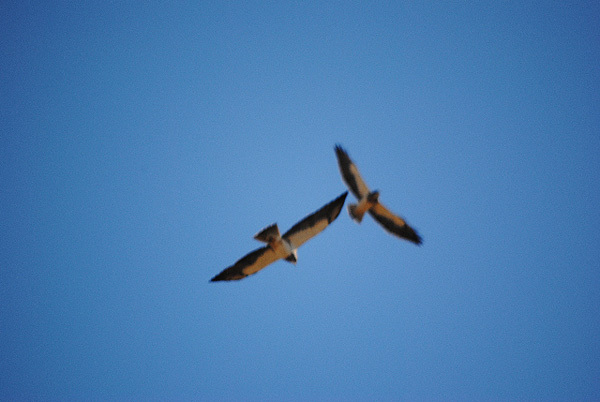 I’m wondering if they were red-tails–they didn’t look like others I’ve seen before, but I’m curious. Also, is this behavior unusual? We saw one pair mate in a treetop nearby, and listened to their distinct calls, the normal “screee” sound, which was quieter than a lot of times, and a kind of warbling call that might have related to the mating, as it was audible just before, and when other birds landed in the trees briefly. In any case–I’m very excited and curious, and wanted to pass on this information to your people who may be doing research on these birds–Getting to see this was really thrilling!! Classic profile of a soaring Swainson’s Hawk. It’s wings are held in a slight upward V; the flight feathers are dark with a uniformly light-colored leading edge. The presence of a complete bib identifies this as an adult. Thanks, Georgia, for sharing these images with us! The birds you observed are Swainson’s Hawks, returning from their wintering grounds in Argentina. They are the last of the large buteo hawks to arrive on their nesting grounds, largely due to their long migration, over 7,000 miles each way. Their semi-annual journey takes up to two months each way! It is the longest migration of all buteo species. Swainson’s Hawks travel in groups, called kettles. Kettles of up to several thousand individuals have been recorded. 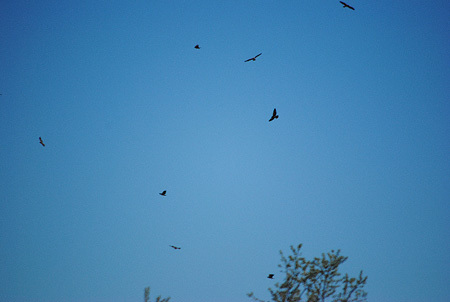 Only Swainson’s Hawks and Broad-winged Hawks routinely migrate in large flocks, called kettles. By traveling in a group, individuals take advantage of thermals by watching others rise on the warming air currents. It is an efficient way to travel long distances — rise in a thermal until it tops out at very high elevations; then soar without flapping until reaching the next thermal, trending slightly downward, until seeing the hawks ahead reach the next thermal. Two Swainson’s soar together above Belen, NM. On their nesting grounds in western North America, Swainson’s Hawk (or Swainies as we call them! ), these hawks eat a variety of small mammals, birds, lizards, and snakes in the spring. However, during the summer months, when the grasshoppers bloom, they prey-switch to a diet that is almost exclusively grasshoppers. On the grasslands of Argentina where they winter, they are called Locust Hawks! A very cool sighting! Thanks Georgia! 4/5/2016 – North of Oklahoma City, Ok – spotted 32 Hawks in a field. Saw this once before about 10 years ago same area. 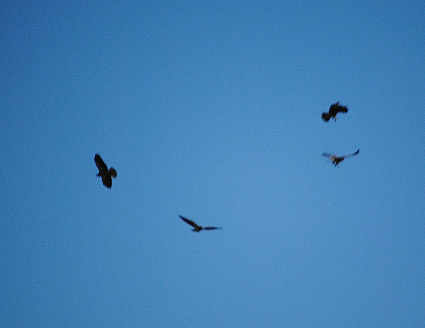 Could these be Swainson’s Hawks?